Q: On July 23, Chinese President Xi Jinping visited Rwanda and the two countries signed 15 documents on bilateral cooperation. On the same day, Indian Prime Minister Narendra Modi also led a business delegation to Rwanda and signed bilateral cooperation agreements with that country. How do you evaluate the prospect and room for China-India cooperation in Africa? A: On July 23, President Xi Jinping paid a state visit to Rwanda and held talks with President Paul Kagame. The two heads of state agreed to strengthen strategic synergy, fully leverage complementary strengths and work for more fruitful outcomes of mutually beneficial cooperation between the two sides. They also witnessed the signing of an array of bilateral cooperation documents under the Belt and Road Initiative. President Kagame said that the Belt and Road Initiative means an important opportunity to both Rwanda and Africa at large, and Rwanda is willing to actively participate in the cooperation under the framework of the Belt and Road. We noted that Indian Prime Minister Narendra Modi arrived in Rwanda for a visit on the same day, and signed a series of bilateral cooperation documents with Rwanda. As the two largest developing countries and emerging markets in the world, both China and India are willing to help Africa within the South-South cooperation framework to accelerate its industrialization and achieve self-driven development. We are also ready to deepen cooperation in various fields with African countries to achieve mutual benefit and win-win outcomes. China and India are on the same page in this regard. This April, President Xi Jinping and Prime Minister Narendra Modi held an informal meeting in Wuhan. In June, they met again on the sidelines of the SCO Qingdao Summit. According to the schedule at this point, the two leaders will meet again on the sidelines of the BRICS Summit in South Africa. This will be the third meeting between President Xi Jinping and Prime Minister Narendra Modi in just several months, which fully showcases the positive momentum in China-India relations. 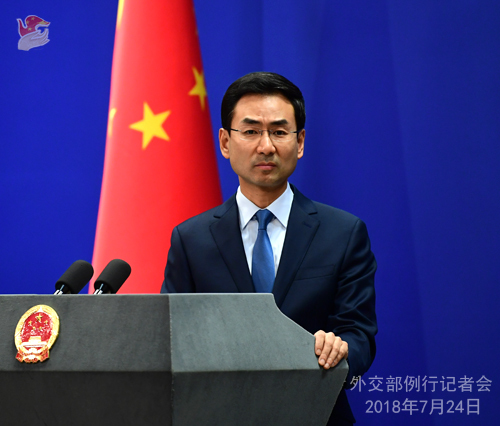 We hope that the two sides will follow through on the consensus between the two leaders and vigorously explore "China-India plus one" or "China-India plus X" cooperation model to achieve mutual benefits and win-win outcomes for China, India and other countries, and jointly make contributions to promoting regional and world peace, stability, development and prosperity. Q: Tomorrow is the deadline for foreign airlines to comply with demand on changing their websites to refer to Taiwan as part of China. Some US airlines have not changed their websites so far. What discussions have you had with the US airlines about changing their websites? What talks has the Chinese government had with the US government about this issue, if any? A: We have stated our position clearly on this issue on many occasions. The one China principle is the universal consensus of the international community. Adhering to the one China principle is the political foundation of the steady development of China-US relations, and the US side is well aware of this. The one China principle is non-negotiable. One thing I would like to add is that we hope the US government will urge relevant businesses to abide by the one China principle and make corrections on their websites as soon as possible. Q: Philippine President Rodrigo Duterte responded to recent concerns and doubts over the Philippines-China relations at home when talking about the ties between the two countries in his State of the Nation Address on July 23. Duterte highly commended China-Philippines cooperation in fighting trans-border crimes and drugs trafficking, and said that the improvement of China-Philippines ties doesn't mean that the Philippines will give up its rights and interests in the South China Sea, and the two sides are handling the differences in a friendly manner via multilateral and bilateral channels. What is your comment? A: We noted President Rodrigo Duterte's positive remarks on the sustained improvement of Philippines-China relations and unprecedented cooperation between the two countries over the past two years in his State of the Nation Address. China appreciates the Philippine government's adherence to an independent foreign policy and its efforts to develop normal relations and mutually beneficial cooperation with other countries on the basis of equality and mutual respect under the leadership of President Duterte. Since the China-Philippines relations realized a turn-around in 2016, cooperation across the board between the two sides has been fully resumed and made remarkable headways, bringing tangible benefits to the two peoples. Security is a key area for our cooperation. China firmly supports President Duterte's effort to fight drugs, terrorism and trans-border crimes to help the Philippine government safeguard national peace and tranquility. Our practice of cooperation in recent years fully showcases that good neighborliness is the only viable choice that serves the interests of the two countries and two peoples, and it is the right direction we should always stick to. Since President Duterte took office, China and the Philippines have been maintaining unimpeded and effective communication on the South China Sea issue, actively conducting dialogue and cooperation, and ensuring stability at sea on the whole. This development corresponds with the shared aspirations of the people in the two countries and makes important contributions to regional peace and stability. China is ready to work with the Philippines to continue to properly manage differences, focus on practical cooperation and jointly uphold peace and stability in the South China Sea. We will continue to work with the Philippines and other ASEAN countries to jointly set up regional rules and promote continuous progress in the consultations on the COC. 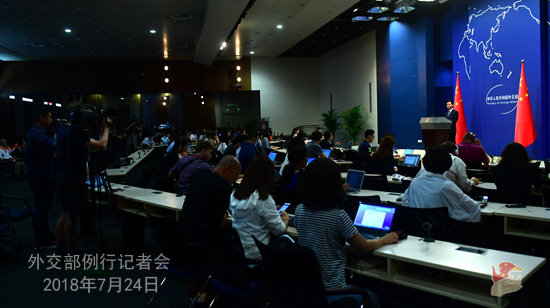 Q: If the foreign airlines do not comply with China's demand to change the reference of Taiwan, what would be the possible sanctions China will take against them? Would that include barring them from using Chinese airports? A: Indeed, as the deadline for the correction of the websites draws near, let's wait and see. Q: There was a sudden and dramatic fall in gasoline prices in the DPRK since June. Some say that the reason for this is because China has increased its supplies of gasoline to the DPRK, possibly in breach of UN Security Council resolutions. What's your response? A: China has been strictly and earnestly implementing all the DPRK-related Security Council resolutions. The relevant Security Council resolutions stipulate that countries should not supply more than 60,000 tons of refined petroleum products to the DPRK annually. 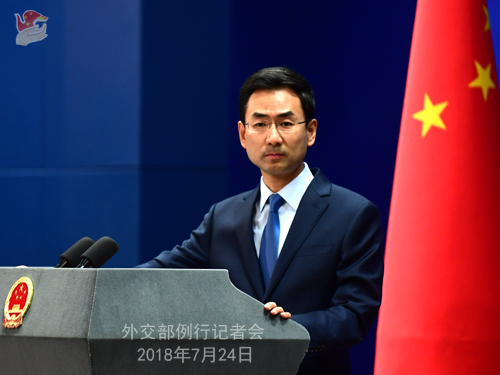 From January to June, China exported 7432 tons of refined petroleum products to the DPRK, which was reported to the sanctions committee in accordance with relevant resolutions of the Security Council in a timely manner. The relevant information is entirely open and transparent. Q: Do you have information on Vice Foreign Minister Kong Xuanyou's visit to Bhutan? What is the purpose of his visit? Was there any agreement on holding the next round of border talks? Any discussion on establishing diplomatic relations? A: From July 22 to 24, Vice Foreign Minister Kong Xuanyou visited Bhutan. He met with the fifth King of Bhutan, the fourth King of Bhutan and the Prime Minister, and held talks with the Foreign Secretary. Chinese Ambassador to India Luo Zhaohui accompanied him during the visit. The two sides exchanged in-depth views on the China-Bhutan relations and border issues and reached common understandings. The information about this visit has been released on the website of the Foreign Ministry, and I would like to refer you to that. Q: Pakistan is to hold an election this week. Leading candidate Imran Khan of the PTI party has been quite critical of the current government and its economic cooperation with China. He also suggested of corruption in relevant projects, some of which under CPEC. Do you have any comment? What are China's plans in dealing with the new government after the election and taking the CPEC forward? A: The China-Pakistan Economic Corridor is a strategic cooperation framework set out by the leaders of the two countries with a view to our long-term development. The CPEC aims to strengthen the endogenous growth of Pakistan, elevate China-Pakistan all-round cooperation and achieve common development and prosperity. The outcomes of the CPEC have played an important role in promoting Pakistan's socio-economic development and improving its people's living standards, winning full support of the Pakistani government and people. We believe that the CPEC will make progress steadily in accordance with the consensus between China and Pakistan and will not be disrupted by external factors. The China-Pakistan all-weather strategic cooperative partnership is now developing with a sound momentum. We are ready to work with the new Pakistani government to stay committed to consolidating political mutual trust, deepening across-the-board practical cooperation and making new progress in our all-weather strategic cooperative partnership.